Is Your Home Reader Friendly? The National Center for Family Literacy reports "parents reading with children improves children's language skills and heighten their interest in books." Highlight the power of reading at home with your parents and students by setting up your own "Is Your Home Reader Friendly?" program. It's as easy as 1-2-3. Open a discussion with students, or have them write an essay, that identifies characteristics of a reader friendly home. Students' ideas might include "has plenty of books and fun stuff to read" or "adults and kids read together." Transform agreed-upon concepts into yes/no questions for a simple quiz. Add a few of your own. My version has only 11 questions and a maximum of 44 points possible. Set up your own scoring system and let students personalize their questionnaires with artwork. Include questions like those below on your "Is Your Home Reader Friendly?" quiz. 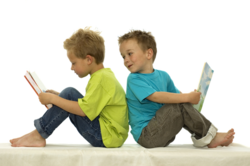 * Do your children see adults or older siblings reading (and talking about what they read) at least three times a week? * Do you ever turn off the TV and substitute reading time? * Can you name a book or story your child is reading this week at home? Information on "Home Reader Friendly Celebration" kits (with certificates, quizzes and an idea factory sheet) is available from the author of this article, also known as the Literacy Ambassador. For more information, send an email inquiry to Cathy Puett Miller. Send the questionnaire home as an assignment for each family to complete together. Reaching at least three fourths of the total points available qualifies a home as "reader-friendly" and qualifies the family for a special certificate. Some families will not make the first cut. Highlight a few questions they answered "no" to, and ask the family to make changes so they can answer "yes" and improve their score. Recommend at least one activity. Allow 30 days for changes and re-score with a new questionnaire. As families qualify, they can add their favorite books to a giant "Books to Make Your Home Reader Friendly" list prominently posted at the school. Short book reviews of those same books can be clipped inside the front cover of the books in the media center. Celebrate progress at a family reading night, special reading celebration, or book fair. Involving parents in their children's literacy development is more important now than ever. Making it fun ensures kids and parents will make time for reading. * Family School Partnerships A brochure from the International Reading Association, available online at https://www.literacyworldwide.org/404?404;https://www.literacyworldwide.org:80/downloads/positions/ps1053_family.pdf. Multiple copies can be purchased for 50 cents each through the IRA Web site.